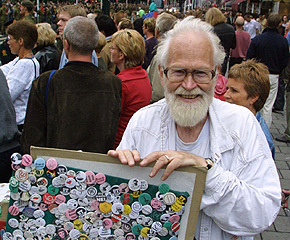 He was perhaps best known for pushing a cart laden with buttons advocating a ban on nuclear weapons and other political causes, but Ole Kopreitan was much more than a fixture on Oslo’s main boulevard, Karl Johans Gate. He was a committed and award-winning peace activist. Kopreitan, who died on Monday at the age of 73, spent more than 30 years leading the Norwegian organization committed to nuclear disarmament Nei til atomvåpen (No to Nuclear Weapons). It was founded in 1979 with the goal of abolishing nuclear weapons, working in cooperation with the International Physicians for the Prevention of Nuclear War and Pugwash, which won the Nobel Peace Prize in 1995. He was also, however, an environmental activist and among the first to publicly oppose apartheid in South Africa and put it on the national political agenda in Norway. He even stormed a tennis match between Norway and South Africa in 1964 to protest apartheid, years before the international anti-apartheid movement gained steam. Kopreitan headed the socialist youth association (Sosialistisk Ungdomsforbund), was party secretary for the former Sosialistisk Folkeparti, forerunner of today’s Socialist Left party (SV), and played a major role in the campaign against joining the forerunner of the European Union in 1972. In 2003 he won the Nuclear-Free Future Award, presented by the Franz Moll Foundation, for his “ongoing political clarification” as a pacifist and leading activist in the worldwide anti-nuclear movement. He also won the Zola Award in 2002, for championing civilian movements. He was born in Stavanger and grew up at Hitra before moving to the Oslo area and eventually to the capital to become a teacher. In between all his social engagements, he pushed his cart, a converted baby carriage, up and down Karl Johans Gate, stopping to sell buttons, hand out pamphlets and chat with passersby, in the hopes of winning their support for his causes.